We believe in a prudent, strategic approach to portfolio management grounded in financial science and real-world results and designed to help you achieve your lifetime financial goals. There are five key concepts which play a vital role in the construction of every portfolio we manage. Instead of trying to beat the market, we believe that you should let the market work for you. In 1965, University of Chicago economics professor, Eugene Fama, developed The Efficient Markets Hypothesis. According to Fama’s research, it is nearly impossible to consistently “beat” the markets using stock selection or market timing. Instead, we believe investors should focus on capturing the capital markets’ long-term rates of return. Markets can be chaotic, but over time they have shown a strong relationship between risk and reward. This means that the compensation for taking on increased levels of risk is the potential to earn greater returns. According to noted academic research by Professors Eugene Fama and Ken French, there are three “factors” or sources of potentially higher returns with higher corresponding risks. Our portfolios overweight small and value company stocks in order to try and capture their potential higher expected returns. Keep in mind, investments in stocks of small companies involve additional risks. Smaller companies typically have a higher risk of failure, and are not as well established as larger blue-chip companies. Historically, smaller-company stocks have experienced a greater degree of market volatility than the overall market average. Historically, small cap stocks have been more volatile than the stock of larger, more-established companies. Combine Multiple Asset Classes that have historically experienced dissimilar return patterns across various financial and economic environments. Diversify Globally — 60% of global stock market value is non-U.S., and international stock markets as a whole have historically experienced dissimilar return patterns to the U.S. Invest in Thousands of Securities to limit portfolio losses by reducing company-specific risk. Invest in High-Quality, Short-Term Fixed Income to lower historical correlations with stocks and decrease default risk. 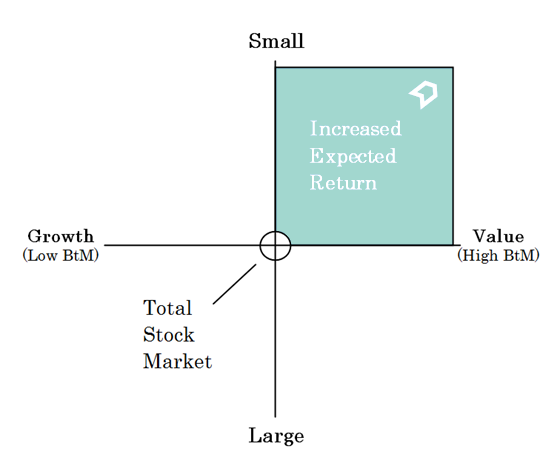 Investing involves risk including the potential loss of principal. There is no guarantee that a diversified portfolio will outperform a non-diversified portfolio in any given market environment. No investment strategy, such as asset allocation, can guarantee a profit or protect against loss in periods of declining values. Past performance is no guarantee of future results. Please note that individual situations can vary. Therefore, the information presented here should only be relied upon when coordinated with individual professional advice. In general, the bond market is volatile as prices rise when interest rates fall and vice versa. This effect is usually pronounced for longer-term securities. Any fixed income security sold or redeemed prior to maturity may be subject to a substantial gain or loss. International investing involves special risks not present with U.S. investments due to factors such as increased volatility, currency fluctuation, and differences in auditing and other financial standards. These risks can be accentuated in emerging markets. Investors should understand that investing in strategies that are non-correlated to the stock and bond markets are not without risk. There can be no assurance that these investments will be profitable and will even outperform asset classes correlated to the stock and bond markets. These strategies may not suitable for all investors. The end result: a portfolio focused on trying to deliver expected rates of return for your chosen level of risk. We believe a long-term perspective is one of the most important ingredients of portfolio success. Stay patiently invested and don’t try to time the ebb and flow of the market. And be sure to rebalance your portfolio periodically to keep it aligned with your goals. Above all, don’t go it alone. Working with an independent Advisor at Old Town Wealth Advisors may help you stay on track towards achieving your long-term investment goals. We can help you manage the emotions of investing and keep you from making hasty, ill-considered decisions. As Investment Advisor Representatives, we have an elevated duty of care, prudence, and diligence, and always put your interests first.